What´s the parabola life time ? What´s the total weight ? Is it water resistant ? * The total weight of the parabolic is 39 pounds. * The parabolic structure, frame and panels should last you many years if taken care of. * The adhesive reflective material used to cover the surface of the parabola can give you about 2-4 years of regular use, but can last much longer if taken care of and kept covered to protect it from the elements when not being used. 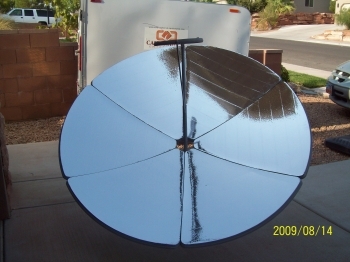 * The parabolic can get wet and it will be fine, but I would suggest not leaving it out and exposed to the rain, because eventually it will have some effect on the adhesive vinyl and may cause the metal part to rust. * To protect the metal, some people spread a light coating of oil on all of the metal parts to help keep it from rusting due to moisture. so if you are interested let me know if you would still like to proceed. I would need your City Postal/Zip Code to give you a more exact cost for shipping. I have sent Parabolics to Puerto Rico and it has not cost very much more.